A wall-of-text housekeeping post today - not the most exciting, but necessary. This post has been sitting on my dashboard literally for years, and I keep not-publishing it because I think it's a bit much. Then I get so much correspondence on this topic that I think maybe it is time to just put it out there. I have regularly and frequently been asked by readers if they might sell the things they made using my free tutorials and paid patterns. The questions come in various manifestations of intent or modi operandi, e.g. I made a Pig and want to sell it at my local craft fair. I made a Lunch Bucket and want to sell it at my school fundraiser/auction. My sewing guild sub-group wants to make your Simple Jumpers and sell them to raise funds for leukemia research. I want to make several Strawberry Bags and sell them in my beauty salon reception area. I want to make Owie Dolls and sell them in my local hospital's gift shop. I made a Chicken and want to sell it to someone in my reading club who expressed interest. I made 5 pairs of those Fold-up Cuff Pants from your tutorial that I found on Pinterest and want to sell them to raise funds for my mission trip. My Early Education Moms Group saw my Marker Pouch and asked if I would make and sell them. Can I? I want to make Bella Bags and sell them in my etsy shop. Do you offer a commercial license? Regular readers of this blog might be aware of my retail policy - that all my tutorials and patterns (free or paid) are for personal and non-commercial use. In other words, using my instructions, photos and patterns to make items for your own retention or to give as gifts is okay and selling them for personal gain is not okay. Doesn't get any more black and white than that. That has always been the principle under which I operated my blog and my etsy shop and for the first few years, everything continued without so much as a ripple. Then I designed those Owie Dolls, and, in response to requests from readers, released the sewing pattern. Which opened up a can of worms that I never anticipated. Initially, the correspondence was nothing but lovely. People emailed to thank me for letting them stock their pediatrician-husbands' medical offices with something that helped them explain tricky diagnoses to little children. Nurses sent photographs to share how those dolls brought smiles to the faces of young patients in their wards. Parents and grandparents wrote to tell me their stories of those dolls helping their little ones understand what their bodies were going through, what their siblings' treatments would look like, what they could expect in their upcoming procedures. I was floored, and many times I got all teary-eyed, humbled and overwhelmed. Then came other email - from folks who saw the commercial potential of these niche-market dolls. They wanted to sell them in hospital gift shops, to toy companies, to support-group members, at medical fund-raisers. Then, the interest spread to other patterns - the Lunch Bucket, the Chicken, The Pig. And tutorials. Every request was slightly and creatively different - and I responded to each email on a case-by-case basis. I was surprised at how difficult it was to say a simple yes or no, not knowing if I was unwittingly setting a precedent, turning away a sincere plea or closing the door on an opportunity to do something good. I have considered all the angles, incidentally. For instance, I've thought about commercial licenses -and went so far as to seek legal advice, after which I decided that they were not the way I wanted to go. I've been in touch with toy companies and toy agents. I've wondered if I should open my hands completely and let everyone do whatever they wanted with anything they got from my site. And at the height of my frustration, I've even thought about shutting down the blog completely and retracting all the printables and templates and tutorials and whatnot. Then, when I was done emoting, I distilled everything down to this: the need for a simple, transparent policy on What Readers Can Do With Things Made With My Tutorials Or Patterns. As earlier mentioned, the black-and-white aspects are clear: it's okay to keep and give; it's not okay to sell for profit. Most people respect that and don't question it. The grey area, though, is what all those aforementioned email requests fall into: folks who want to sell for "a good cause". Let me say upfront that I am not planning to release commercial licenses for any of my patterns or tutorials. I will also never give blanket approvals for events, causes, charities, organizations, educational efforts or persons. Folks will still need to write to or email me with each particular request and I will still ask for specific details to understand their situations, after which I might still say no. Please understand that I am a compassionate person and I appreciate the cost of fabric and how difficult it is to make a living as a single mother and how important medical research is and how crucial it is for independent groups to find their own ways to raise funds without government support. Please also understand that I am trying to find a way to say yes to you that will sit with my conscience, and that it can sometimes take me days to formulate the words to reply to you. And, more fundamentally, please understand that as much as you are passionately sewing to support your cause, I am passionately working to protect my intellectual property from abuse, both deliberate and accidental. I try to explain all these ideas and principles to anyone who emails me with a request to sell things they have made with my tutorials or patterns. However, because it happens so often, I thought I'd do a post to explain my policy in general. Hopefully, this will make things clearer and, consequently, filter out the requests that are clear "no"s and leave just the ones about which we can have an actual conversation. Q: Can I Make A (insert project from ikatbag here) From Your Tutorial/Pattern And Sell It To Raise Funds? All three have to work for me. If you (or your sewing group) alone hand-makes it, it is okay. If you outsource some part or all of it to a third party for the purpose of making larger quantities than a single person (or sewing group) can normally make, it is not okay - that crosses over into commercial mass-production. End of discussion. Because I retain the sole rights (since I am not offering commercial licenses) to sell items made from my own instructions, I cannot approve of your sales taking place on the internet. The internet has a permanent record of anything posted - this means that long after something disappears in real life (e.g. you sell off an item), its record remains on the internet to pop up in web searches. An easily-visualized repercussion of this is folks writing in later to say, "Hey, I saw so-and-so selling your Chicken on her site! How come she can and I can't?" So, all sale, marketing, publicity etc. needs to be physical and to stay off the internet - i.e. no etsy shops, ebay auctions, instagram, Pinterest, facebook or twitter posts, please. You can still publicize by word of mouth, in-person, personal email, paper flyers and posters, over the table at your craft fair booth or at the PTA meeting while planning your fundraiser. Since you put in the work to sew the item, it is only fair that you take credit for the workmanship. You set your own price. You can also attach whatever label you want to indicate the person who made it - "Handmade by Jean", "Made With Love By Susanna" etc. However, you will also need to return the credit to me for the design of or pattern for that item. 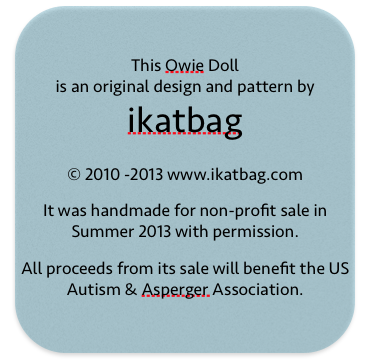 We do this by attaching a second label so your buyers know that I am the designer, that your item is being sold with permission for the purpose of fundraising, and that the money they're spending goes to the organization you have named. Whether you pocket the money yourself later is between you and your conscience; I absolve myself of any blame should you get sued later. This is the greyest of the grey areas: what exactly counts as a "worthy cause". Is big-organization national autism research more worthy than personal mission work to the human trafficking districts of, say, India? I am not interested in weighing the relative merits of either. I am, however, interested in the accountability involved in the fundraising. I am generally okay if the sale benefits individuals other than the seamstress herself - otherwise, it isn't that much different from selling stuff for personal or shared profit. Also, and related to accountability, I usually say yes to specific fundraising situations e.g. "A local craft fair in the spring of 2016, to raise funds to send a medical team to China in July 2017 to work with kids with cleft palates" and no to vague, blanket contexts e.g, "Me and a couple of my mom-friends want to raise funds for our homeschool coop textbook fund." If requesters are still in the conceptualizing stage of their planning, I will ask them to commit themselves to a specific fundraising event before I say yes to anything; there's no knowing otherwise what I might be saying yes to if, months later, their plans evolve to something completely different than what I was initially comfortable with. Let's flesh out a little more what this accountability might look like. After I've understood the parameters of the seamstresses' fundraising effort, I send them digital labels they can print out to attach to the items they will be selling on that day(s). The labels explain the origin of the idea and design, that the items are being sold with my permission, and the specific cause their sale benefits. Each situation is different and each set of labels is customized to reflect that. On my end, I also keep a record of the names (and businesses) of the seamstresses (or the requesters), their affiliated "good causes" and the details of their specified fundraising event for that good cause. Here is an example of a label (the actual one will not look like this at all, of course) might look like. Some will be more detailed than others, depending on the situation. The quickest way to get me to understand your context and situation is to provide me with very specific details in your email. If yours is a vague request e.g. "I was thinking about the possibility of making your Chickens to raise funds for my local charity...", I will either reply to you with more questions of my own or unintentionally ignore you amidst the deluge of other email requests I receive each day. I take a fashion design class at the local community college. Can I adapt your drafting instructions in my assignment? I promise to give you credit. I am a librarian at XYZ school. We're having a Readathon and would like to print your bookmarks for the kids to color at a little art corner and take home. I will of course give you credit. I am a classroom teacher teaching a module on careers. I saw your Happy Families card game on Pinterest and thought of making a few sets for my students to play with. I'll be giving you credit, naturally. I'm writing an article on sewing bags for my (free) newsletter. Can you send me some high-res photos of your strawberry bag? I am happy to credit you and link to your blog. I have a small business in sewn goods and to rev up interest, I want to use your free tutorials and patterns to teach people in free workshops that I'm planning to offer in my store. With credit to you, of course. give me more details - what, when, how, where, how long, how many, how often, what form, who? The more specific you are when you first write to me, the more quickly and fully I will understand what is being asked of me, and the more likely I will be to have an answer that is helpful to you. Details also help me set up protective boundaries around the future use of my work. Even when I am considering each request as they come into my mailbox, I am thinking ahead to how that organization might evolve, how that sewing guild might grow, how that sewing course might explode. Will my sleeve-drafting tutorial, as a result of a link to a link to a link to a link, end up being inadvertently published in some periodical as part of someone's thesis who never intended it to? Could my Five Stones instructions, casually printed out for a kids' summer camp workshop, end up being "innocently" photocopied for a community fundraiser by one of the kids' mothers? What if my free smocking pattern ends up incorporated into a free handout given as a "Bonus Gift" with a small business's commercial smocking kit? This is why I cannot give "concept approvals" i.e. I will never say "yes" if you ask me if I am "okay with the idea of..." No one can fully fathom where that idea will go, given enough time. I understand that often, people want to test the waters before actually investing the time and money in a venture i.e. they want the reassurance that I am okay with their intention to sell my stuff for their worthy cause before they actually go out to JoAnn to buy the fabric and set up weekly sewing nights with their friends. Reciprocally, please understand that I need to test the waters back at your side of the riverbank, so that I know what exactly that "intention" looks like in practice. Perhaps this all sounds overwhelming to most of you reading this. And I wouldn't be surprised at all if some of you are even be rolling your eyes while phrases like "raving lunatic", "control freak" and "ridiculously type-A" cross your minds. Not a bit. Ask me 5 years ago when the old blog first got off the ground if I thought that anyone would want to even look at my stuff, let alone sell it. I'd have blushed and snorted. It does sound a bit much. And it does sound like I've been working in the government a bit too long. Unless, of course, you've been there yourself, in which case you'll understand how difficult it is to know what to say when other people ask to use your work for themselves in good ways. That may have good or bad repercussions. That, at the moment of the request, you know not of. And we aren't even talking about the times you've had an idea or photos stolen, a post republished on another site without credit, a free tutorial turned into a pattern that someone else has sold for their own gain - and other not-good situations that make your heart sick just to remember them (which you try not to). Then the moment passes and you pick yourself up and say, "I'm not throwing the baby out with the bathwater. Let's find a way to work with the baby." And so this, friends, is why I don't say an outright no, and how I am willing to explore those grey areas for you. And why I am willing to take the extra time to converse with you so I can understand your situation. I want my work to benefit other people and bring joy to them; it is exactly for this reason that I started sharing it with you on this blog. But I also want to be protect it and be prudent with how it's used by other people who aren't me. I hope these are helpful guidelines as a start. I will continue to correspond with you in your individual situations and answer your specific questions as you write to me. Brava! Reasonable and well-explained. Keep up your good work! Obviously you've spent a lot of time thinking this through and figuring out how best to deal with it and explain it. You've made it clear and easy to understand, and I hope it lessens your load of all those vague (and not-so-vague-but-crazy) email requests and that people will comply. It's not so hard to do things right... really! I just personally want to say thank you for continuing. I can only imagine how frustrating it must be as an artist, and a compassionate humanitarian one at that, to continue to work with the baby when the bath water is evidently so murky. I particularly am thankful for all the free tutorials and instruction series and concept explanations bc there is no way on earth I could afford what they are worth and yours are so comprehensive yet patiently explained. This post fills me with respect for what you deal with and gratitude that you keep dealing with it. Thank you. You sound anything but crazy -- more like supremely generous and supremely patient. Thank you for your wonderful blog. Wow -- LiEr, you are being very generous and gracious in the way that you're navigating this murky situation. If anything, take consolation that it's because your ideas are so unique and special that people want to use them! "Unless, of course, you've been there yourself"
Well written and kind. I don't think most people have any idea how much time it takes to deal with inquiries, and I believe you are very generous to take the time to deal with them at all! Very reasonable and well written explanation of your position. I am always impressed at how thoughtfully you reply to my occasional emails and requests. I am delighted you didn't decide to take down Ikatbag, and am forever grateful for all your brilliant posts and tutorials. I admire your thought process, whether in your tutorials or otherwise - as here. Eloquent, clear, generous, and obviously the result of much deliberation. I do hope it helps, that people actually do read this and understand it before they write to you. Alas, humans are humans, so you will be, still, swamped by the same kind of requests as before. And I know that you will, eventually, just smile and shrug, and help them anyway instead of blowing your top. Because you are, I think, a wise person. This seems very clear, reasonable, and well thought through. Wonderful explanation and thank you so much for taking the time to be so clear! I totally get it and I applaud you for sticking to your guidelines. You go, girl! I love your tutorials. I am confused on one point though. I could have sworn when reading through your bag making lessons that since you were teaching theory and technique, but not releasing firm patterns and such, that you were encouraging entrepreneurs to use what we had learned to make our own different types of bags (or slopers since you did a whole teaching series on those) in a style we liked. I'm would hate to think I had trampled upon a copyright (or ethical) issue for a blogger who I respect and adore. When learning shaping and construction techniques from tutorials I had always assumed that the product, since not using a template, was the creators. Maybe I'm looking at it wrong? Ronja, you are right - that was exactly what the concept tutorials were for. These were not the issue in this post. If you make a bag pattern and sell it, that's wonderful. If you drafted a sloper and sold it, that's wonderful, too. Or a sleeve. Or a dart. And if you made a bag using the pattern you designed yourself, that's just as wonderful. The grey area (for me, anyway) is if folks used the templates/patterns/tutorials (not just the concepts i.e. there was no independent design work on their end, just a following-of-instructions) here to make items to sell for profit, or when they used the instructions in a curriculum for which they then charged people money to attend a course to learn (or download). Also, I don't think I'll ever have this issue, since I can never seem to make anything, even from a template, without slashing up the pattern or adding something or taking something away or changing it in some manner. Causes some problems sometimes, but usually I make it work. *smiles* Following the pattern is boring! Thank you so much! I <3 your work and your clear instructions make it so much easier to learn a trick or three. Okay. I started going through the bag series and sold some of the things I made because I had thought I had seen the okay, but when this post came out I couldn't find what I thought I had read. You have many years of posts to search through, so after a quick scan I figured I would just ask you. I am an accountant and so I REALLY like playing by the rules. It's all those pesky ethics classes! Your hard work and creative concepts are respected. Thank you for sharing your skills and making it possible for many of us to learn and make fun stuff for our loved ones. Hooray for you! It's your work and you are entitled to protect it. I'm glad you are clear about a readers obligations if they want to reproduce an item from your patterns or tutorials. My husband writes and publishes about finance and it's amazing how many people, even well-known, who simply lift whole paragraphs and put them in their own books with no attribution. Thank God for the publisher who takes care of this for us. Thank you so much for sharing. This was really clear, and very interesting. As someone who has thought about starting a crafting business this was very helpful both from the perspective of how much is it ok to "be inspired by"/"steal from" others, and how can one protect ones own designs. It is clear that you have put a lot of thought in to this, and have come up with some really great guidelines. You are fabulous. Thanks for all that you do!